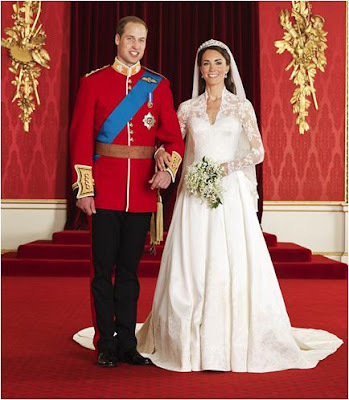 Catherine Middleton decided to keep the identity of the designer of the most anticipated royal dress in years – the one she’d wear to wed Prince William of Wales on April 29, 2011 - a secret until her wedding day, as is the bride’s prerogative. The designer with the golden ticket was Sarah Burton, Creative Director at Alexander McQueen. And keep the secret she did, not even telling her parents until the night before and going so far as to send an entire white collection down the runway ahead of the wedding to help mask the work and materials for this one gown. The top secret end result is made of ivory satin gazar over white satin gazar with lace appliqué sleeves and adornment on the bodice, skirt, and train. True to the McQueen name, it’s a wonder of structure, with a boned bodice and padded hips. It features a deliciously draped skirt with a modest train (just under 3 meters, or 9 feet) that managed to keep its shape while walking down the aisle, skillfully avoiding the dreaded toilet paper trail of a train that has taken down many a good wedding dress. 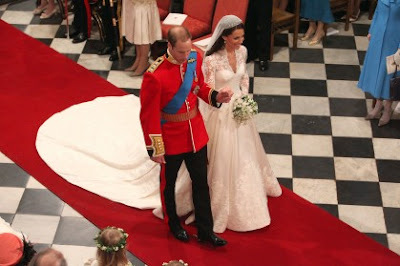 Kate wore a fingertip veil of ivory silk tulle with an embroidered lace edge, the length and shape of which was designed so that it did not obstruct the lace on the train. She topped it with the Cartier Halo Tiara on loan from the Queen. 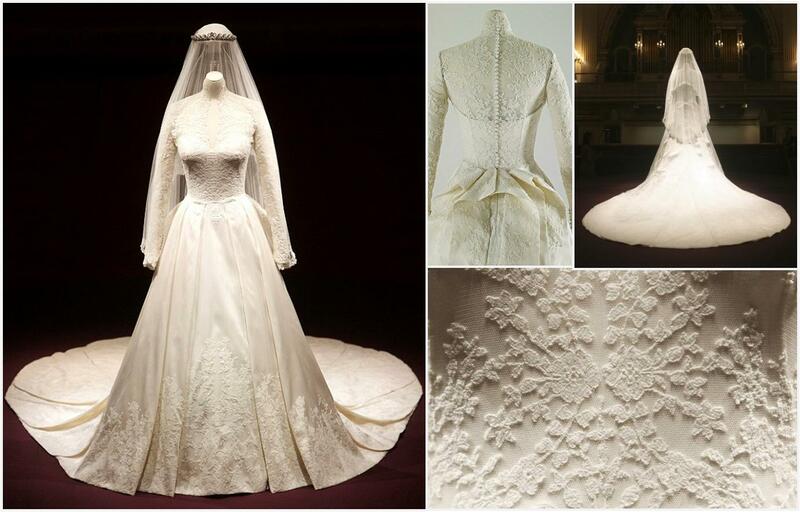 Many of you listed national pride as a key quality to making a list of the best royal wedding gowns, and this gown quite rightly headlined the Buckingham Palace summer exhibit as “a story of great British design”. It was made by one of the most recognizable brands in British fashion today, Alexander McQueen. The lace was assembled by the Royal School of Needlework, and it incorporates the classic floral symbols of the United Kingdom (roses for England, daffodils for Wales, thistles for Scotland, and shamrocks for Northern Ireland). There are British influences in the inspiration as well, in the Victorian structure (just look at the waist and that back, with its bustle and multitude of buttons) and the Arts and Crafts insistence on handmade details. Another requirement frequently required to qualify for the best list was a timeless design, and I have to say this gown comes through there as well. This is traditional bridal – concepts like lace appliqué aren’t ground breaking, but they’re also never going to go out of style. With so many classic bridal design features, it’s no wonder this has drawn comparisons to other famous royal wedding dresses, like Grace’s or Margaret’s (it nearly tied with Margaret’s on this countdown, and I personally was firmly in the Grace camp at first, as a lot of the details that make it its own gown weren't visible on television). I don’t know that this is original, but I do know that Catherine won’t live to see the day when she’d cringe to have worn it. Perhaps that’s more important than originality when it comes to a royal wedding gown; after all, these brides can’t hide their wedding pictures from public view. And this gown has indeed been seen over and over again – seriously, even now I swear it pops up in searches for anything royal or wedding related. Kate’s the Royal It Girl, and this dress is still having its moment. That Buckingham Palace summer exhibit I mentioned before? It drew record crowds and raised £10 million for the Royal Collection. The gown is still frequently mentioned around this blog, popping up in the comments even when I haven’t referenced the Duchess or the dress in my writing. Even those that bring it up only to tear it down are still bringing it up – I mean, you’re still talking about it. On that basis alone, it deserves a spot on any 2012 list of best royal wedding dresses, and so it has claimed the middle spot on yours. What puts this gown in the Top 10 for you? Gold Star: Another Royal Wedding Ahead!